October 27, 2013 — Our annual jack-o-lantern carving night always starts the same way…running around town at the last minute trying to find any remaining pumpkin carving implements and candles amidst the sleighfulls of early Yuletide merchandise impinging on Halloween. It’s the most surreal part of the season. 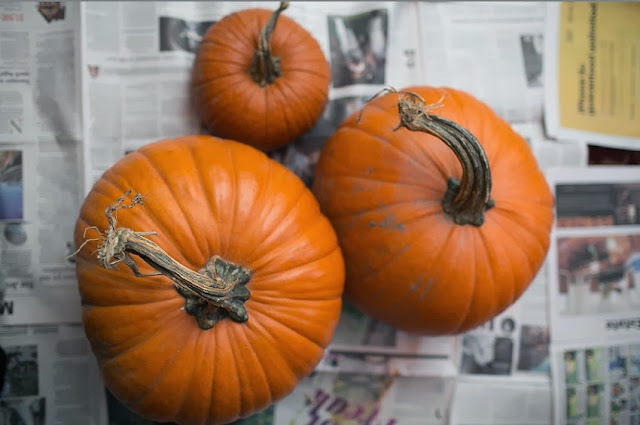 And while I can’t lie and say my own head hasn’t a few times already turned on its compass toward the north pole (I actually bought a case of Cranberry Sprite Zero today), I’m still firmly rooted in the pumpkin patch of Halloween. 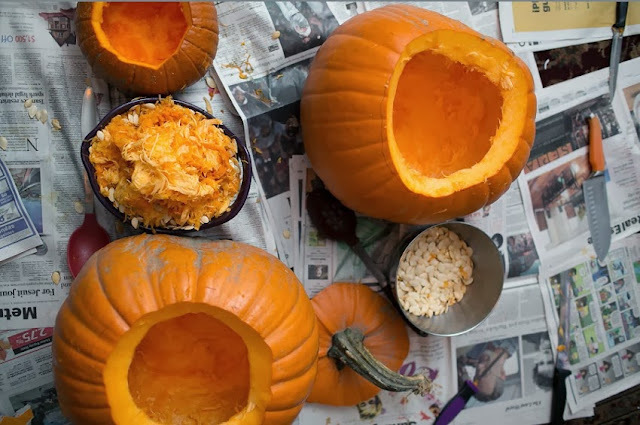 Because of all the Halloween nights, the night we carve the jack-o-lanterns is the one most sacrilegious to taint. But I’m not going to slip all orange and philosophical like in years past. I’m just going to talk pumpkins. We used to choose our pumpkins for their shape and color. This year, and I guess it’s our burgeoning maturity, we chose them mostly for their gnarled stems. The headware kind of makes the pumpkin. And look at the stems on these gals. You can hardly tell I had to superglue one back on because my kid broke it (why would they put handles on them if you aren’t supposed to use it?). Anyway, we always watch a well-worn movie while we mutilate, and this year I kind of wanted to watch the way underrated Chipmunks Halloween movies (Alvin and the Chipmunks Meet the Wolfman and Alvin and the Chipmunks meet Frankenstein), but my wife was in a Beetlejuice mood. 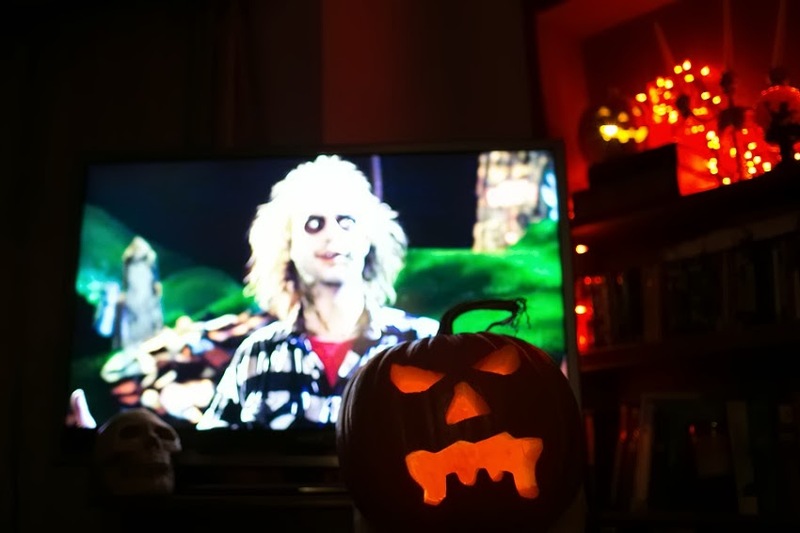 And you can’t stop a Beetlejuice mood, even if you own the Harry Belafonte box set. You have to satisfy it. As for the faces we gave our fruit, my wife went back-of-the-head-Charlie-Brown classic, and my daughter wanted hers to look “dead” (and apparently loving it). I, well, I messed up. I had this whole face planned on paper. It was going to be a lost soul kind of pumpkin, with sad eyes and a mouth dripping the moans of the damned. However, in my fervor to give life, I automatically gave it evil eyes. I guess it’s my default setting. Now the jack-o looks more feral and foaming (although every once in a while, I can't un-see the mouth as a massive mustache). I guess that’s okay. You can’t mess up a jack-o-lantern. One of these years, I’m going to write down all my jack-o-lantern lessons in list form. 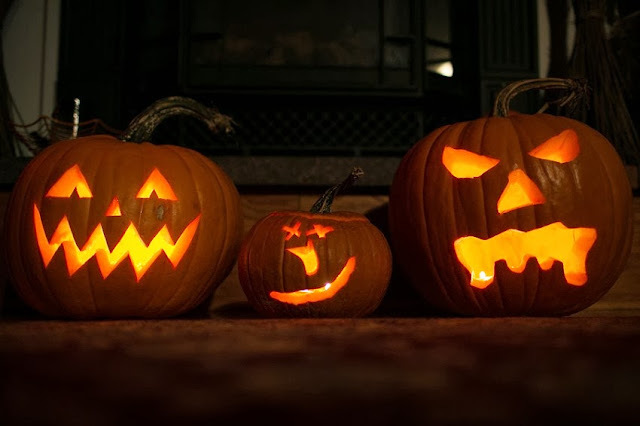 So now our trio of pumpkins is hollowed, cut, and lit. All that remains is to roast their seeds and then, come Thursday, they get set on the cold wood of the porch to lure children to our door. Somehow, a carved head is the last leg of the season.